Opera Ireland’s ‘prison’ La Bohème follows the lead of an Italian production of 2004 with design contributions from detainees at Maiano Prison, Perugia. The Maiano La Bohème was the subject of a documentary by Porzia Addabbo, chronicling the endeavours of maximum security detainees to create something beautiful and transcendent while in fact even more incarcerated than the characters confined by lifestyle and economics in Puccini’s vision of the writings of Henri Murget. The current Irish production utilises designs from the Maiano iteration constructed by prisoners at Dublin’s notorious Mountjoy Prison, a run-down Victorian institution itself the subject of a talking-point documentary in 1997. The ‘Mountjoy La Bohème’ duly arrives in a blaze of publicity sufficient to warrant an article in The New York Times, and yet, truly, and most disconcertingly, this aspect of things fades into background trivia in the face of a production which is otherwise very polished, very well acted, and extremely well directed. Had the sets been built by ordinary construction artisans and the production designed by professional designers, it would have no doubt resulted in little that is different from what is presented now. The sets and costumes are great, but unless you are prepared to read very deeply indeed into the design aesthetic and attempt to draw correlations between the confinement of the garret set and the style of the costumes evoking the 1970s (when the production is set) and the prisoners’ experience of being cut off from the world for many years, there is little going on here that will give Opera-goers much pause to consider the lives of detainees as anything other than an interesting, possibly poignant, sideline to their evening’s entertainment. This leaves this reviewer in something of a bourgeois quandry in reviewing it. 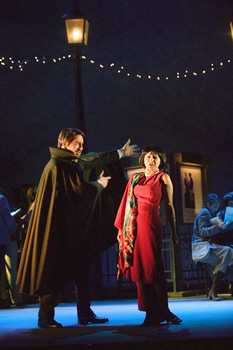 This is one of the most enjoyable productions presented by Opera Ireland in recent years. It boasts some of the best acting I recall seeing on the Gaiety stage, with lively, convincing characterisations presented by all four of the principals. It is expertly directed by Addabbo, especially the second act, where the potential for chaos as the Opera Ireland chorus and a hosts of children roam the stage while the principals sit stage right on the café set. She retains clarity and pace throughout, and after a slightly draggy first act (enlivened by great management of the comedy scene where the bohemians befuddle their landlord seeking rent), the production moves extremely well. The presentation also offers exquisite conducting by Alexander Anissimov, who coaxes subtlety and delicacy out of the RTÉ concert orchestra, though he can’t prevent the Gaiety acoustics from drowning out the leading tenor, as is usually the case at this venue. The problem is to what extent one’s liberal heart should quail at this lovely high culture experience propping itself upon the endeavours of men behind bars. Though no doubt working on the project provided an outlet for creativity and self-expression that was no doubt enriching and hopefully fulfilling for these people, how many of them sat with the high and the mighty on opening night? How many of them sat with me? Be that as it may, in responding to what was to be seen, it is difficult to be anything but wildly enthusiastic. Though the strongest vocal performance by far is given by Massimo Cavalletti in the role of Marcello, closely followed by Alessia Grimaldi as Musetta, the acting really is remarkable here. Fiorella Burato fills the role of Mimi with a combination of strength and vulnerability, and looks and acts for all the world like a lost soul of the 1970s dying of a mysterious ailment which we may choose not to read as TB in this setting. Cavalletti is a marvellous Marcello, exuding the brooding energy of a bohemian painter and the power of a friend and confidant to Andrea Giovannini’s ever-so-slightly flighty but dynamic Rodolfo. Grimaldi is a frankly stellar Musetta, utterly dominating her second act appearance amid the hustle and bustle of a full stage. Paolo Pecchiloi is both funny and tender as Colline, sporting sunglasses and punk-dyed hair, but shedding all pretence for his moving aria on the sale of his overcoat in the final act.